Well the thunderstorms started last night and it is supposed to be storming off and on for a day and a half. This means bored and grumpy kids. My kids hate being stuck inside and seeing how dark and gloomy it is outside does not help. 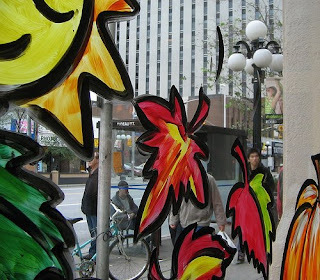 I thought that today might be a perfect day for window paints. It will give them something to do and brighten up the day. Add the dish detergent to the tempera paint slowly until you get a smooth, paint-like consistency. Clean the window. When it is dry, start painting your picture. To clean off the paint, simply wipe the window with a paper towel, then clean the window with your regular window cleaner. Very simple. I can not tell you how many times parents have asked me what they can do to get their kids in the bath without it becoming a big battle. When my girls were little I would make it a fun and relaxing time for them. We had bath toys and games they would play with but their favorite bath time fun was when I would make them Bathtub Paints. What could be more fun then finger paints made out of soap in a place that is easy to clean up? Spring really is here. Everything is turning green and flowers are in bloom. It is so beautiful outside. The kids want to spend time outside so it is time for an outside craft. 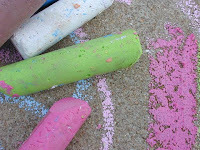 Why not have fun making your own chalk? They can have fun and be creative. I do not think kids ever get too old for chalk. Even my 13 year old has fun drawing with chalk on the driveway. It also gives me some free time to enjoy the outdoors too. They stay busy having fun so I do not have the constant interruptions. Combine and stir together. Let stand a few minutes. Place tubes on cookie sheet lined with foil or wax paper. Pour mixture into holders and let stand until semi-firm. Remove holders and let dry completely. *Ready to use in 1 to 1 1/2 hours. (Reminder, never pour plaster down sink). Do you remember the first time you had a box of Cracker Jack? My mom did not get us snack food and treats very often. That was one of the reasons that I loved going down the block to my friend’s house. Their house was like a wonderland for kids. There was always something fun going on and they always had great things to eat. The first time I had Cracker Jack snacks was at my friend’s house. I remember thinking about how much I liked it and that it turned popcorn into a very special treat. At my house all we got was that flavorless air popped popcorn and Cracker Jack brand popcorn was sooo much better. As if that was not enough, it came with a prize inside and as a kid that seemed pretty awesome! Cracker Jack brand is now celebrating 120 years of being an American icon and tasty snack. It is as American as baseball. For years when you thought of baseball you thought of the Cracker Jack brand. It is even a part of the unofficial anthem of baseball. To celebrate 120 amazing years of Cracker Jack Snacks they have come up with the new flavors Butter Toffee and Kettle Corn and they have added more nuts to the original Cracker Jack snacks. You can also get a new enhanced price in every package. There are now new classic stickers with fun facts and digital codes that unlock surprises online through a free Cracker Jack-branded app (www.CrackerJackApp.com) featuring two nostalgic games (Baseball and Pinball). You can step back in time with a game and also enjoy a great fun treat from childhood. Don’t forget that they are still fun for kids too so don’t just hog them all. Share some with your kids too! Here at Your Fun Family we are joining in on the celebration with a giveaway! One lucky reader will receive 6 bags of the new assorted flavors of Cracker Jack snacks. All you have to do is use the form below to enter. Prize can only be shipped in the US. Disclosure: Free products for review, information, and giveaway prize provided by the Cracker Jack brand. April is National Grilled Cheese Month and I have been trying out some awesome grown up grilled cheese sandwiches! It has been a very cold April here in Wisconsin so we were still eating a lot of soup and we all know about the love affair between soup and grilled cheese! Grilled cheese is the prefect canvas for food fun. You can add herbs, spices, meat, vegetables, and even some peppers to really liven it up! Multigrain bread, 1 slice of American cheese (the good deli kind), 1 slice of mozzarella, 2 slices of bacon, and 2 slices of tomato. *Warning – If you put the tomatoes on and cook the sandwich with them inside they turn to molten lava and you can burn your mouth. I cook the sandwich openface so the tomatoes get a little warm but there is no fear of lava. As I have gotten older my love affair with grilled cheese has had to be scaled down. I can’t have a lot of dairy now and gluten is not my friend. Thanks to Udi’s I don’t have to worry about the gluten! I recently received some samples of Udi’s Gluten Free Foods Whole Wheat Bread, Millet Chia, Omega Flax and Fiber, and White Sandwich bread to help me celebrate National Grilled Cheese Month. I love bread with some texture and flavor so it was a real treat. My kids loved the white bread. I rarely ever buy white bread for them so they enjoyed it. What is your favorite grilled cheese? And what Udi’s bread would you pair with it? I finally bit the bullet and bought a new car! I have been driving a Ford Expedition XLT Eddie Bauer 4×4 with 3rd row seating for 4 years. Yes, I did list everything! I really wanted you to get the full idea of how much gas I was going through!!! Now that I am driving 30 miles every day just to get to the office and back plus driving around to show houses…. It was costing me $500-$600 a month in gas!!! When I looked at the numbers I realized that if I wanted to spend that much money I would rather spend it on a newer car at least! Plus add on that it would look cooler to clients! So we headed out to the car lots in the search of that mythical vehicle that would make me happy. I had soooo many things on the list of wants that I did not think it was going to happen. I wanted 4×4 or AWD yet still be good on gas, enough room for my clients and open house signs, the ability to see out of it (I am under 5 foot tall so that really is an issue), and of course it had to be pretty! Now do you see why I said mythical? I looked at small SUVs but the ones I saw were either not 4×4, not good on gas, or looked cheap inside. Then I was shown a crossover and I was just about to buy it when I realized that the salesmen must have forgotten my insistance on 4×4 or AWD because he brought me a front wheel drive. I do way too much driving on busy highways and country roads and Madison, WI gets quite a bit of snow!!! Over and over people kept telling me that what I wanted was a Subaru. I assured them that they were wrong and I would not be buying a Subaru! I was actually getting sick of people saying it because it kept happening. When I thought of Subaru I pictured a hippy… and that was not me! After I caught that the salesman had brought me a front wheel drive and was about to leave he raced back to me with a hot looking sporty car that looked like nothing I would ever buy. I would look at it and think it looked hot but I would never buy it. I am a mother! I need more room! I need to be sensible! The salesman got me in the car for a test drive… It WAS a hot car! It had enough room when you think about the fact that my kids are teenagers and we seldom ever need everyone in a vehicle at once. The kids actually said, “Wow, it is bigger on the inside… just like the Tardis!” The trunk is big enough to hide maybe 3 bodies! Did I mention what a hot car it is!?! Oh yeah, and it is AWD. Well, I got it last night and so far, I am in love!! !